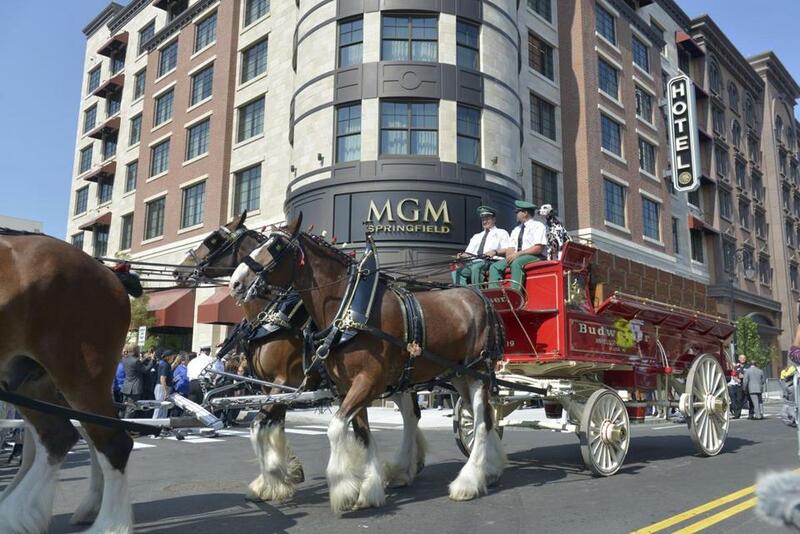 Among the celebrations that accompanied the opening of MGM’s new casino in Springfield last month was a grand parade featuring Budweiser Clydesdales. MGM’s new casino in Springfield opened with much fanfare last month: a grand parade featuring Budweiser Clydesdales and a marching band, and a crowd waiting at the door. MGM boasted it received 150,000 visitors in just its first weekend. But what about the casino’s gambling revenue? It’s probably too early for MGM to celebrate on that front. The first returns are in, and they’re essentially unremarkable. The Massachusetts Gaming Commission reported Monday that MGM received nearly $9.5 million in gross gaming revenues for its first eight days (technically nine, including the bets placed at a VIP party on Aug. 23, the eve of opening day). That puts it on track for over $430 million for a full year. MGM had originally predicted $500 million annually, by year three. Clyde Barrow, a casino expert at the University of Texas Rio Grande Valley, says these numbers show MGM is coming in right on target — unlike some newer New York casinos that missed their early projections. But Paul DeBole, a political science professor at Lasell College in Newton, takes a different view. He says he would have expected MGM to be jamming in its first week, due to all the media attention and hoopla. He looks at another metric: average daily revenue per slot machine. By his conservative calculations, using an eight-day period, that figure totals $360 per day, roughly in line with spending at the same time at Plainridge Park, an all-slots casino that opened in 2015. MGM, in contrast, is the state’s first resort casino, with table games to help attract the crowds. DeBole says he would have expected a much higher figure during MGM’s opening week. Yes, it’s hard to draw much of a conclusion out of just eight days. And it’s worth noting that MGM has roughly twice as many slot machines in Springfield than Penn National has at Plainridge, where poker and blackjack don’t compete for gamblers’ attention. But it’s a safe bet the gaming commission will be watching MGM’s returns closely. The commissioners are weighing whether to allow a resort casino in the southeastern part of the state, and they’ll be looking for evidence about whether the southern New England market is already saturated with enough gambling options.